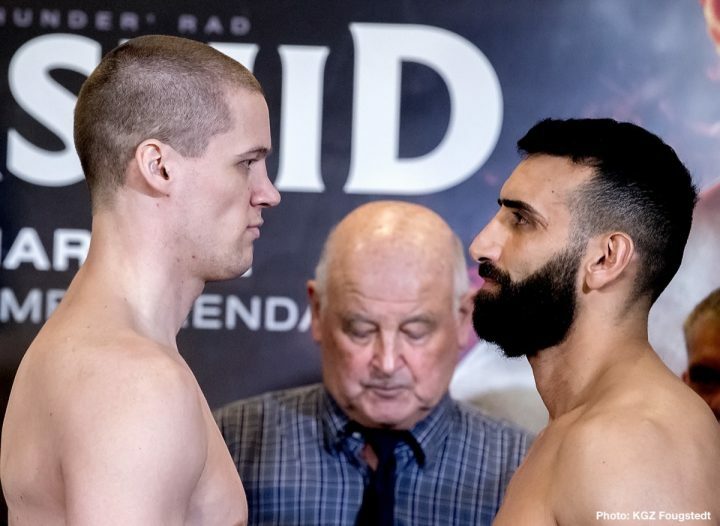 Kai Robin Havnaa (13-0, 11 KOs) and Rad Rashid (16-4, 13 KOs) both made weight today ahead of their IBO International Cruiserweight title fight tomorrow night at the SØR Amfi in Arendal, Norway. All the action will be shown live on Viasat 4 in Norway and live on SPORT1 in Germany. Havnaa faces his toughest career test against Frankfurt’s ‘Thunder’ Rashid, and can become the first Norwegian boxer to claim an international title on home soil for over 40 years as he returns to his hometown arena following his stoppage win over Daniel Vencl at the SØR Amfi in February last year. 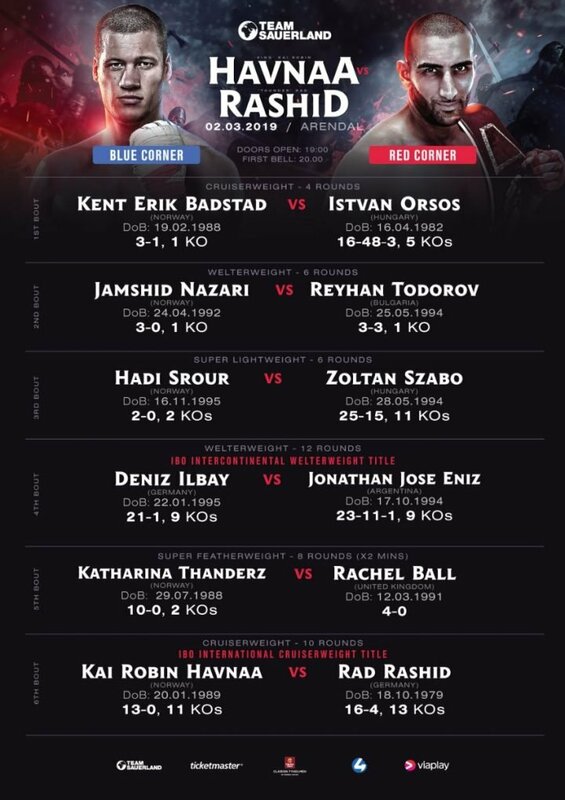 An action-packed undercard features top Norwegian talent Katharina Thanderz, Hadi Srour, Jamshid Nazari and Kent Erik Badstad, plus a IBO Intercontinental Welterweight title fight for German boxer Deniz Ilbay. “It’s an exciting fight,” says Hansvoll, the former World title challenger, who will be ringside commentating on all the action for Norwegian broadcaster Viasat 4. “It’s a big step up for Kai Robin with his first title fight, and I’m really looking forward to it. This is Kai’s dream, to follow his father (former WBO World Champion Magne Havnaa), and finally step into the elite division. “It’s not going to be easy because Rad Rashid means business. Kai will have to be well prepared and he will need to be careful, especially in the opening rounds, because Rashid will be starting with the big punches early. Havnaa will be without coach Joey Gamache for the first time in his career after he was injured in an unprovoked attack. Despite his absence, Hansvoll is sure Havnaa, and stand-in coach Erling, have the experience to get the job done. Ilbay’s IBO Intercontinental title fight is the second championship contest confirmed for Arendal with hometown hero Kai Robin Havnaa facing Rad ‘Thunder’ Rashid for the IBO International Cruiserweight title. 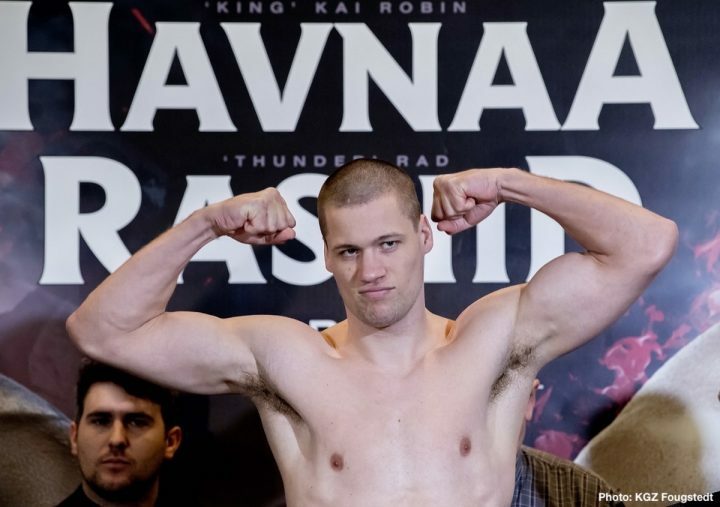 Badstad will be boxing on the undercard of Havnaa’s hometown show at the SØR Amfi, and following his first-round knockout victory over Gennadi Mentsikainen on February 2 in Vantaa, Finland, the 31 year-old from Trondheim takes on Hungary’s Istvan Orsos (16-48-3, 5 KOs). “It was great sparring with Kai,” said Badstad. “I had a great time in Arendal with him and his uncle Erling. We had many good, tough rounds together that I think we can both be happy with going into our fights next Saturday. “From my point of view, Kai is in the best shape ever. I’ve never seen him looking so good. He was really sharp in sparring and I know he’s going to be really fit and ready to win the IBO title against Rad Rashid. “My last fight against Gennadi Mentsikainen was a very important victory for me. It has given me a lot of confidence and a good feeling for my next fight, although I was hoping it would last a little longer. Walsall boxer Rachel Ball is in confident mood as she heads to Norway this weekend writes Ben Gibson. Ball (4-0) steps up to lightweight and puts her unbeaten record on the line against former European and WBC International Champion Katharina Thanderz (10-0, 2 KOs) on March 2 in Arendal. “My last training session was on Wednesday night and it was just a light session as I rest for Saturday,” she told bcb-promotions.com. “I always train hard and most days I train twice per day. “We have done more sparring and more strength work in order to prepare for stepping up in weight and it has worked. “I am still strong at this weight and I can hold my own against welterweights. “I have increased my strength work for this fight. “We don’t want to fight lightweight all the time but this was too good of an opportunity to turn down. Ball, a former three-time world kickboxing champion is promising another ‘war’ as she travels the North Sea to take on the undefeated Thanderz. Travelling abroad is not a new experience for the 27 year-old and it is one she is relishing. “I have fought abroad before I turned pro and I have always won,” she added. “I know that the odds are not in my favour as the away fighter but I always perform in the ring and I am prepared to give everything to make sure I get the win. “It definitely comes with added pressure and it is my biggest fight to date regardless of it being home and away. “Being away from home I need to give the judges no reason to give to rounds to Thanderz because she’s the home fighter. “Fighting away can be less stressful as you don’t need to worry about ticket sales or getting tickets to people. “It has been nice to just focus on my training and diet and diet for this camp. “I will miss my rowdy crowd as I have a lot of love for the people who support me.